ALI WATKINS TTN TUCR President Erik Jacobs led a teach-in on the GOP primary race. Jacobs said Mitt Romney’s success thus far would likely earn him the nomination. 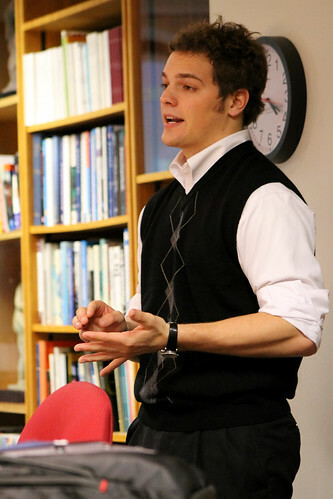 TUCR President Erik Jacobs led the latest Dissent in America teach-in. Politically conscious students were treated to a comprehensive overview of the 2012 GOP nomination race on Friday, Jan. 27, at a weekly Dissent in America teach-in organized by professor Ralph Young, Ph.D. The teach-in, led by Temple University College Republicans President Erik Jacobs, presented information and sparked political debate and predictions among students. Jacobs opened the teach-in with a very extensive look in to the major players of the GOP nomination game. Attendees of the teach-in were able to weigh what they believed to be the good and bad sides of the candidates involved. When it comes to front-runner Mitt Romney, former Massachusetts governor, Jacobs predicted the nomination would have his name on it. However, Jacobs was quick to point out that, while still being widely supported by the political right, Romney has been critiqued for ‘flip-flopping’ on his political stances. These sentiments were echoed in Jacobs’ opinion of Gingrich. “There are a lot of issues where Newt has been on both sides. He’s not ‘Minnesota nice,’” Jacobs said, referencing the term used for former candidate Tim Pawlenty’s ‘push-over’ reputation. After some in-depth looks into the major players in the race, Jacobs devoted time to a candidate who, he said, has gotten shafted by the mainstream media but holds a lot of potential to attract democrats and younger voters. “A lot of people around my age support Ron Paul’s libertarian approach to the republican party. His foreign policy, opening up and talking to people, opening up trade – he’s got a lot of cross-over and young voter appeal,” Jacobs said. Although some students in the audience told The Temple News they didn’t identify as republicans, many said it was nice to hear a different point of view. “It’ll be interesting,” said Jacobs, referring to the presidential election. Between rising gas prices, the state of the economy, and the threat of another credit downgrade, Jacobs is confident that the GOP can secure a victory. Ron Paul supporters, if you haven’t already, please go to VoteRonPaul and make your pledge to vote for him. Take a look at the map that is shown. It’ll show supporters from across the country. Please share the page with your friends, family and other Ron Paul supporters and scroll down to the bottom to like their facebook page. I would love to see EVERY Ron Paul supporter make their pledge to vote for him. We know that Ron Paul has faced and will face continued efforts to marginalize him and even attempts at voter fraud (Iowa for example!) If we could get every single Ron Paul supporter to this site and make their pledge, it is my belief that it will be hard for them to ignore especially when we start seeing numbers into the millions. We would make people’s eyes pop out of their heads when they see the sheer number of us and no one will ever have a reason to say he is “unelectable” ever again. Thanks.